One of the hardest restaurants to get a reservation for for Pittsburgh Restaurant Week was Butcher and the Rye. From the creators of Meat and Potatoes, initial feedback on Butcher and the Rye involves a surprising menu. Considering the “Butcher” name, you would think it would be a steak-heavy menu, but in fact it is the vast array of meats that compliment the whiskey selection (the Rye). Beef, pork, duck, rabbit … if you can hunt it, I bet it will probably appear on the menu at some point. 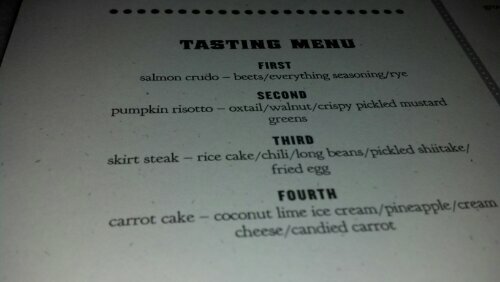 So for Pittsburgh Restaurant Week, a $35 tasting menu was the perfect way to get to know this new restaurant. 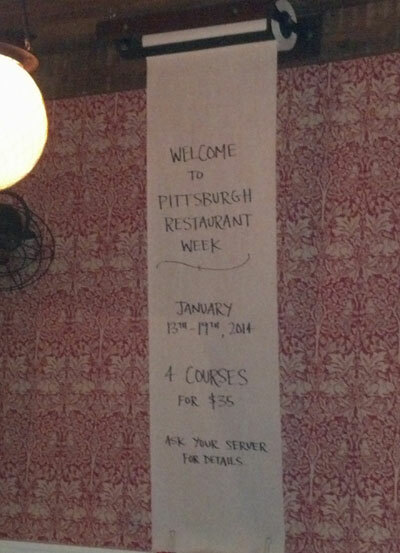 Unlike some restaurants, it was great how Butcher & the Rye championed the Pittsburgh Restaurant Week celebration and hung a special banner near the entrance for all to see. Because the items changed daily, new menus were printed each day with the tasting combination of the day. On January 17, the courses were Salmon Crudo, Pumpkin Risotto, Skirt Steak and Carrot Cake. The dish arrived and it was colorful and vibrant, even in the mood lighting. After the obligatory photoshoot, I put my fork into one of the rich pink blocks of the dish expecting it to be the salmon, when in fact it was a beet. While surprised by the very different taste and texture, it was a well pickled beet. 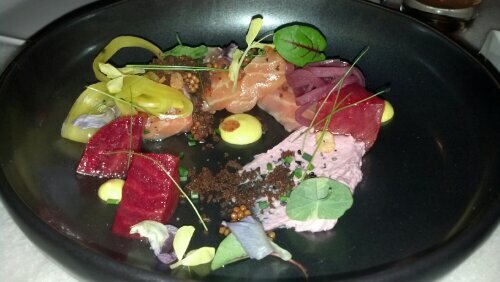 From the texture, I estimate the beet was lightly house-pickled by one of the B&R chefs. Having my bearings on the dish, I went for the actual salmon on bite number two. The dish was good and mixed flavors I wouldn’t have expected. The everything seasoning was gritty which was a texture I didn’t care for. Overall, I wouldn’t order myself, and I will assume that the chef wanted to experiment with this non-menu item. Looking at the photo below, the dishes presentation wasn’t at the level of the other three dishes, but the taste was on the spot. The dish was a base of pumpkin risotto. The creamy substance on the left side of the dish was actually a light infused foam, perhaps infused with walnut oil. 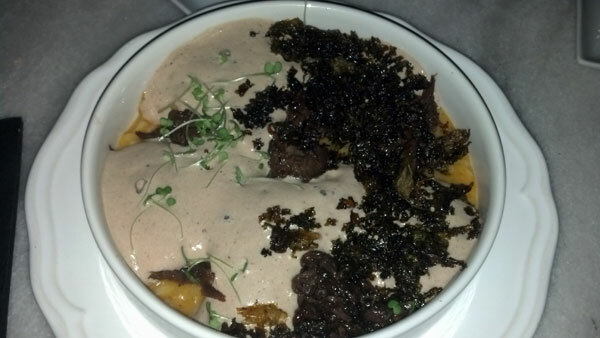 The dark topping on the right side of the dish was a deliciously braised, pulled oxtail. 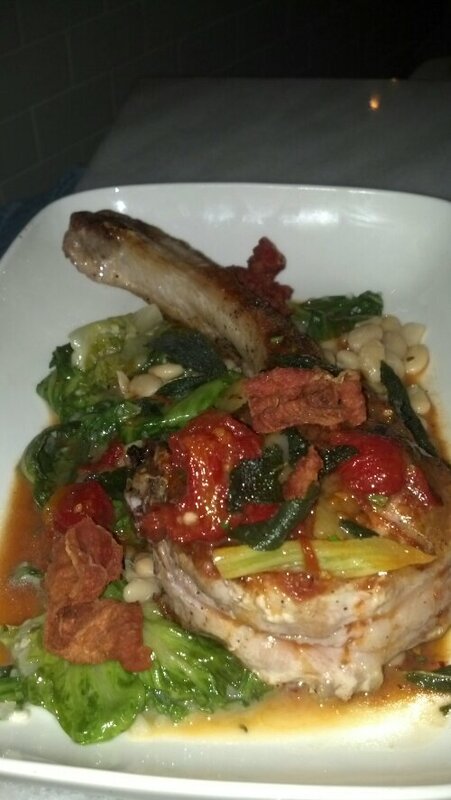 The dish was rich with soul and the flavors worked best when you had all of them in one fork full. While it wasn’t going to win any #BestPhoto award for restaurant week, it was an item that I would order. 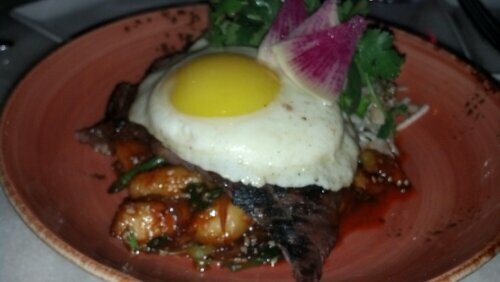 When perfectly cooked meat is served with an egg on top, it may beg the question, why cover it up? When in fact the yolk turned out to the tastiest “steak sauce” I’d ever eaten. Sorry A1. This dish was served with each component stacked above the next. 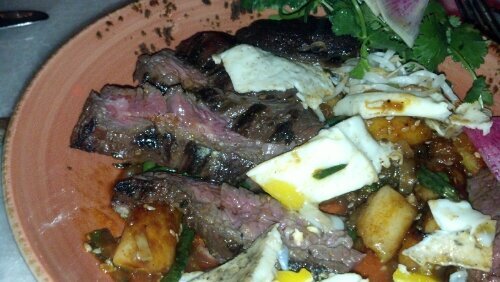 Inside the dish, the skirt steak was already sliced and cooked to a tender perfection. The rice cakes emulated potatoes but with a lighter, chewier texture. The chili sauce added a slight heat to the dish that complimented the running yolk. As you can imagine, by this point of the night I needed to save some room for dessert so I finished the steak and reluctantly turned the dish in. And my oh my and I glad I did. The meal ended on such a delicious high note. The carrot cake was about a 2-by-5 inch piece of cake placed in the middle of a slate slab with cream cheese icing smeared across the slab. 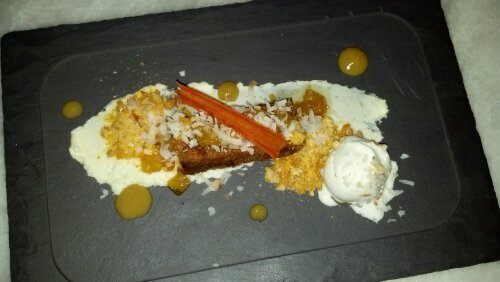 Atop the cake was a some toasted coconut and a elegant crisp candied carrot. To accompany the cake was a sweet, cold delicious coconut lime ice cream which added just enough sweetness to the dish. The cake was moist and delicious. My only critique is the yellow dots that scattered the slab; these were a pureed banana which was slightly bitter and didn’t compliment the cake. Luckily the banana was easy to avoid eating. I would without a doubt go back just for to get this dessert and a drink some evening. While the entire experience was great, including the service on a very packed night, the dessert sealed the deal. I enjoyed the Pittsburgh Restaurant Week tasting menu, but one of my dining companions did not. If you’re curious what a regular sized entree looks like, here is a picture of his pork chop measuring about just over 10 inches in length.